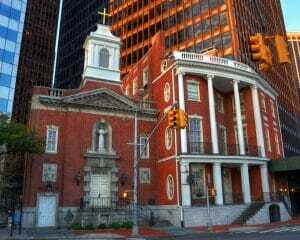 The Shrine of St. Elizabeth, located at the Church of Our Lady of the Holy Rosary in Lower Manhattan, will provide your group with the amazing story of Saint Elizabeth Ann Bayley Seton. St. Elizabeth is remembered as an incredible woman, a loving wife, mother, and unfortunate widow by the age of 29. Born in New York during British occupation in 1774, Elizabeth lived next door to what is now her devoted shrine, from 1801 to 1803. After her husband's death in 1803, Elizabeth turned to the Catholic Church for spiritual guidance, though she had previously belonged to an Episcopal Church. She was confirmed Catholic in 1805 and went on to perform wonderful deeds including establishing the first Catholic girl's school in the country as well as founding the first American chapter of the Sisters of Charity. Her dedicated shrine in New York is a beautiful destination to pay homage, pray, and rediscover the legacy of St. Elizabeth.